MONEY SAVING TIPS (Link) Our newsletter also includes tips on ways to save money in the Spokane Valley. Here is a long list of proven ideas. VALLEY SCOOP PROFILES (Link)…… For nearly five years I wrote a newsletter featuring profiles on interesting Spokane Valley individuals and businesses. If you have lived in the Valley for any lenghth of time, you will be familiar with many if not most of the subjects. DeerHart Design Homes Visit a gallery of homes we have built in the Spokane Valley. http://www.spokanehomedesign.com/ Visit our plan drafting website. The Black Diamond at Farr and Vista is serving espresso and breakfast right out of their Nite Club during the early light of day. It makes more sense than it sounds, luckily. In the first place, it is a very comfortable room with raised, leather booths, elegent light fixtures and a great sound system. In the second place, it is an interestingly lit room in regards to the windows. During the night, the windows are not a factor while during the day it becomes clear the place has a nice window pattern that ushers in the sun. So the room is like the sanctuary in most modern open-bible churches these days that are designed to multi-task, accommodating the night time parishioners as well as the day time parishioners. But most importantly, Kenna the Cook, who owns the place with her husband Steve, is a foodie and it shows in the menu. Well, I knows it showed in the breakfast I had which was a called a Monte Cristo Egg Sandwich. I love all the sinful egg, and naughty meat, and useless pancake/biscuit/french toast/whatever sandwiches that everyone sells us. 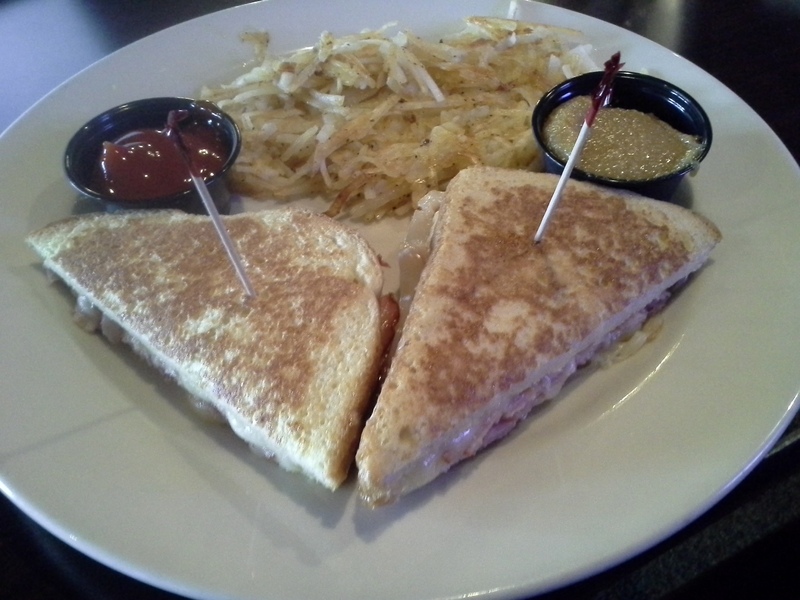 I also love a Monte Cristo sandwich whenever I can find a place brave enough to put out a rendition of this slightly exotic sandwich. Kenna took my two guilty pleasures – the Cristo and the Count of Calories breakfast sandwiches- and went one beyond anything I had ever had. Out of nowhere there appeared on the plate a homemade honey mustard that mustard come from heaven. I never would have thought to dip a Monte Cristo sammy in honey mustard but then again I never knew there was such a good recipe for honey mustard here on Earth.It is Kenna’s own recipe and it is spot on. They are open at 7 seven days a week so I have ample opportunity to give Kenna’s equally intriguing Green and Ham a try very soon. The mustard is must have. Of all the structures spread across our little spot on the globe that someone long ago euphemistically labelled “The Inland Empire”, there is one building that towers above the rest in the landscape of my life. Other buildings perhaps were more significant like the Baptist church at 8th and Pines that Elaine’s and my parents religiously attended during our youth. Significant also is Sacred Heart Hospital where we were born and where I have gone to visit many loved ones through the years from my grandfather who passed there when I was 5 to my youngest child who had an appendectomy there not long ago. But the building I am most fond of by far is the Coeur D’ Alene Resort. We are here now for our anniversary and I am sitting in room 342 as I begin this story while Elaine is in the bathroom mid-way through her tedious task of prepping for public presentation. Sometimes it seems I could write an entire novel while she wades through this job. Less than 100 feet away is the room we slept in the night we eloped. 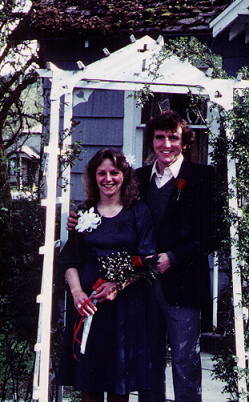 Thirty years ago I got down on one knee after dinner in the small house she and her sister rented from their grandfather. After an 8-month courtship and a life-long friendship, I knew it was time to live together. Both being Baptists, that meant matrimony not shacking up. She said yes and after a 21-hour engagement, we wed at the Wedding Chapel on a warm and sunny afternoon. Even though it was only a moderate-sized hotel called the North Shore back then, it was the perfect spot to spend the most important night of our young lives. It was the first night either one of us had spent at the hotel but The North Shore was a familiar and favorite place for both of us. Though we did not know it growing up, the North Shore, like Pines Baptist Church was a place our families were serviced on Sunday. Throughout our childhoods on special occasions we gathered with our grand folks at the hotel’s penthouse restaurant, The Cloud Nine, and partook in a Sunday-only, family style repast of fried chicken, mashed potatoes and green beans. While I miss nothing as much as the grandparents we ate there with, the food comes as close as any I have ever had. The North Shore was great and still remains hidden right where it has always been, but it was a mere a shadow of its present self. 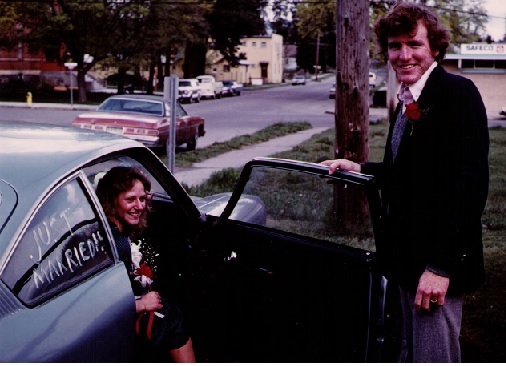 Three years after our nuptials night, Duane Hagadon and company transformed the place into The Coeur D’Alene Resort in 1986. It was a bold and breathtakingly area-changing move that gave the world a classy new destination to discover and it gave us Inland Empirates a world-class destination in our backyard. Amazingly, they replaced the old Sunday best-meal-for-miles with a new improved version that has easily retained the title to this day. Being a rather classless fellow who took the recent closing of The Old Country Buffet like a death in the family, I have been head over heals since that first I time I pillaged my way through the Dockside’s ultimate Sunday brunch, swelling like a tick on a hound dog as I gorged like it was my first meal in days. Through the years it has been that place for me that Jesus talked about here on Earth with acres of delicious meats and salads and desserts gloriously laid out each Sabbath. If I did not know better, I would think the Son of Man himself was back there in the kitchen performing culinary miracles. Then there has been our annual Thanksgiving getaway since back in the days when all four of the kids could strap onto me like barnacles on a whale as I slogged through the pool like a mighty behemoth with the aid of water’s buoyancy magic. For them it was a trip of wonder with the parade and fireworks and pageantry of Christmas trees. There was always breakfast with Dad while Mom did what she never got to do at home, sleep in. We never had to leave the hotel if we did not want to, though we always did to catch a holiday movie which too often for me was Harry Potter. Those days are behind us now and it is back to just Mom and I but the Resort is still here for us. Just like our marriage, the old place is better than ever. If you have not seen The Resort since the remodel last year then you are missing something amazing. They put in a huge aquarium with beautiful coy fish bobbing boredly back and forth with the sun shimmering down through a massive new skylight on their confined but very eye-catching existence. A little further down the lobby a new water feature cascades at the entrance of the elegantly opened up and transformed Whispers Lounge. Like everything about this heaven away from home, the new trappings of the lounge are suave and comfortable with its bank of windows to the south dramatically letting in the marina and then the lake with the mountains filling up the background. To the west Hagadone’s office hovers over the lake, propped up on all four corners by massive log pilings. For years I have pictured him in there working away and I have dreamt of walking in and introducing myself. I picture shaking his hand and thanking him from the bottom of my heart for giving me and my wife and our children a wonderful place to accrue memory after memory. It will never happen but I can content myself by going down to his lounge and tipping my glass to the man with my bride who has just now finished making herself beautiful. As always it was worth the wait and as always I found something to keep myself busy with. Outside the long gone Wedding Chappel. Our other alternative was the Hitching Post, which seemed like a name more fitting for people tying the knot for the third or fourth time. Elaine would have nothing to do with it and the Wedding Chapel turned out to be romantic. The drive to the hotel was even shorter than our engagement and one night honeymoon. We would later take that 76 Vega on a real honeymoon around the entire country, travelling 6200 miles and burning an entire case of oil. 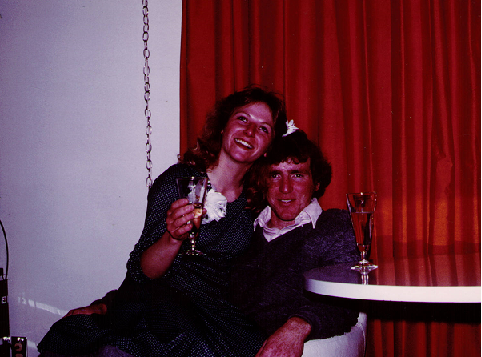 Here we are in our hotel room on the first night we went to sleep together as husband and wife. The only thing better than falling asleep next to her each night has been waking up next to her and appreciating again and again that she is there for me whatever the day has in store.